The jury is out! 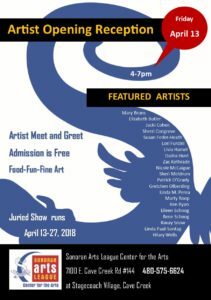 Several fine artists including dhSeadragon, are showing some amazing art for this juried event at the Sonoran Arts League Center, 7100 E. Cave Creek Road in Cave Creek, AZ. Come out to the party to help kick off the show tonight from 4-7 pm. There will be food, drink, and some really beautiful art to check out. The show will run through April 27.